To get bitcoins, you’ll need to open an account with QuadrigaCX, verify your identity, and then fund your account with Canadian dollars. Once you take these steps, you’ll be able to buy bitcoins on the exchange and then use those bitcoins however you wish. Follow this link to open a QuadrigaCX account. From the QuadrigaCX homepage, look for the “Register Now” button in the top right corner of the homepage. Clicking the “register now” will take you to the registration page where you submit basic information about yourself. Fill out and submit the registration form and you’ll be asked to choose a password and a pin for your account. Once you’ve made your initial registration, you’ll be provided with a client ID which will serve as your username. You’ll also be sent an e-mail to confirm your registration. Save your account credentials in a secure way so you can easily access your account in the future. Now that you’ve opened an account and logged in, you’ll land on a “Member Dashboard” screen. Before you can exchange Canadian dollars for bitcoins, you’ll need to verify your account. See your name listed in the top right corner of the header menu? Click on your name to reveal a drop down menu, then choose “Verify”. When I registered, I took a picture of my drivers license from my phone, I downloaded a copy of my phone bill from Rogers.com, and I took a picture of myself holding my drivers license. A few minutes later, a representative from QuadrigaCX called me to confirm my identity, and even asked me to confirm some credentials listed on my LinkedIn profile. Once you’re verified, you’ll need to transfer Canadian dollars into your account. Click on the Canadian dollar balance listed in the header menu of the “Member Dashboard” page. Doing this will reveal a drop down menu, choose the “fund account” link that is listed. There are a few ways to transfer Canadian dollars into your account. For most of us, the best way is to use Interac Online. It will cost 1.5% for this method, it might be cheaper to use a wire transfer if this is a capability your bank provides. Now that you’ve got some Canadian dollars in your QuadrigaCX account, you’re very close to buying bitcoins! The next step is to exchange your Canadian dollars for bitcoins. Find the “Trade” tab in the main menu of the “Member Dashboard”. Once on the trading page, you’ll see a market to buy and sell bitcoins (XBT) for Canadian dollars. To make a trade, the QuadrigaCX exchange will charge you a 0.50% fee. So between your 1.5% Interac fee and the 0.50% exchange fee, the explicit fees are 2.00% to buy bitcoins. On the “Trade” page, you’ll see a list of orders to buy and sell. To buy bitcoins, you’ll need to find someone that will sell them to you. Notice the sell orders are higher than the buy orders, the cheapest price you can buy is the lowest offer listed for sale. You can either bid a price that matches the lowest sell offer for the amount of bitcoins you’d like to buy or the amount of Canadian dollars you’d like to sell. Either way, you’ll need to pick a price. If you decide to work an order at a particular price, simply enter it in the buy side and your order will appear in the order book and be listed as an open order in a section on the “Trade” page. If this part seems confusing to you, then maybe you can enlist a friend or financial advisor to make the trade with you. 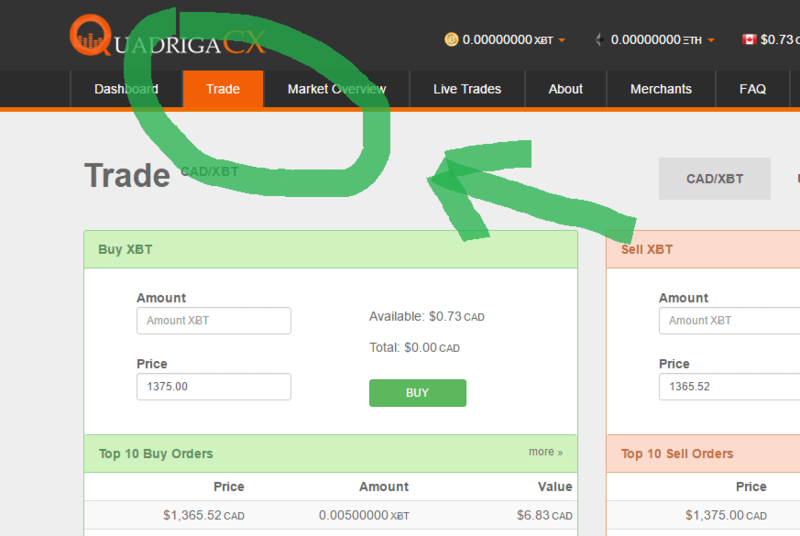 Once you’ve exchanged your Canadian dollars for bitcoins, you’ll see a XBT balance appear in the balances listed in the header menu of your QuadrigaCX account. To transfer your bitcoins to another bitcoin address, choose the XBT balance from the header menu and click the “withdraw” option. You will be asked to input an amount, a bitcoin address, and your pin. You’ll also be sent an e-mail to confirm your request. Transferring bitcoins requires a few checks. First, QuadrigaCX will confirm that you made a valid request, and then your transaction will go to the bitcoin blockchain for confirmation. Once your transaction has been confirmed by the blockchain, your bitcoins will now be in the new bitcoin address you wanted to transfer to. This may take a few minutes or more. If it takes more than 1 hour to process your withdrawal request, something is wrong. That’s it! 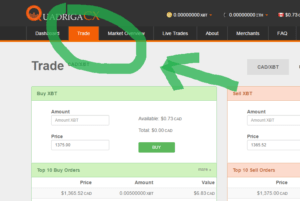 Whenever you want to buy or sell bitcoins for Canadian dollars, login to your QuadrigaCX account and make a trade. A few other tips, to further secure your account, check out the “profile settings” and “notification” pages on QuadrigaCX. You will be able to add 2 factor authentication to your account and notifications when logins or requests are made. Thanks for your comments, I’ve never had a problem with QuadrigaCX. I’ve been able to use Interac transfers to get money on the exchange and I’ve been able to use several withdrawal methods including EFTs and I even used the cheque method one time.